Providing you the best range of flute laminator machine with effective & timely delivery. 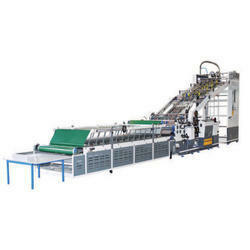 We are leading supplier of Flute Laminator Machine. Flotech fully automatic flute laminator machine has automatic top and bottom paper feeding system at high speeds and with high laminating precision resulting in the good quality passing of the sheet. This machine can laminate 2ply sheets in A, B, C, D, E, F flutes and can do 3 ply / 5 ply boards. This machine is suitable for the top paper of 200-600 GSM quality. Looking for Flute Laminator Machine ?